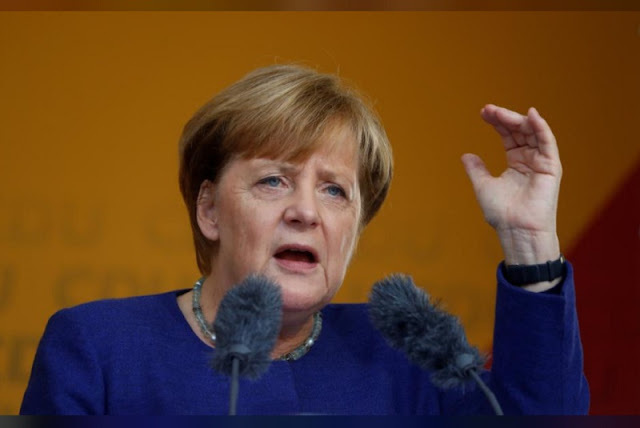 German Chancellor Angela Merkel, a top candidate of the Christian Democratic Union Party (CDU) for the upcoming general elections, gestures as she speaks during an election rally in Fritzlar, Germany September 21, 2017. BERLIN - Fears in Germany that voter apathy could boost the far-right Alternative for Germany (AfD) in Sunday’s election have driven Chancellor Angela Merkel and her main rival in final days of the campaign to urge their backers to go out and vote. With many voters viewing a fourth term for Merkel as almost inevitable and turned off by a turgid campaign - occasionally punctured by heckling and tomato hurling in protest at Merkel's refugee policy - pollsters say turnout may be low. A GMS poll on Thursday said those not planning to vote or were undecided numbered 34 percent, higher than the 29 percent who did not vote in the last election in 2013. “My request to everyone is that they vote, and vote for those parties that adhere 100 percent to our constitution,” Merkel told MDR radio on Thursday, pointing to the AfD which has been likened by some commentators to Hitler’s Nazis. Some of its members have called for Germans to rewrite the history books on Nazi era and the party has been dogged by rows over Holocaust denial, a crime in Germany. Although polls show conservative Merkel, trusted by stability-loving Germans to stand up to unpredictable leaders in the United States, Russia and Turkey, is on track to win, the shape of her coalition is wide open. Most pollsters say a low turnout could boost the AfD which has gained popularity by focusing on migration and security. Poised to be the first far-right party to enter Germany’s parliament in over half a century, comments by some top members have caused outrage. This month, one leader said Germany should be proud of its soldiers achievements in World War Two. Allensbach pollster Renate Koecher told Die Zeit weekly that much depended on turnout. “Willingness to vote” was strongest among conservative and AfD supporters, she said. Most undecideds were FDP, Green and Left voters, indicating that a higher turnout would help the smaller parties on the left, she said. The two biggest blocs have dipped slightly in most polls in the last month or so while some of the smaller parties have inched up. In the GMS survey, the AfD was up two points at 10 percent. Merkel’s conservative bloc slipped one percentage point to 37 percent and her main opponent, the Social Democrats (SDP), were unchanged on 22 percent. SPD leader Martin Schulz has also urged his supporters to vote, saying “everything is still possible”. In a highly unusual intervention this week, Merkel’s right-hand man Peter Altmaier, head of the chancellor’s office, stirred controversy by suggesting it would be better for Germans not to vote at all rather than vote for the AfD. SPD Justice Minister Heiko Maas accused him of helping the AfD. “Telling people not to vote is helping the AfD’s campaign, that’s exactly what they want,” he said. The latest surveys suggest coalition options are limited to another grand coalition of Merkel’s conservatives with the SPD or a three-way “Jamaica” alliance of the conservatives, FDP and Greens which could limit Merkel’s room for maneuver on euro zone reform. “Before the last-minute mobilization efforts by parties, the only realistic coalition option, apart from a grand coalition, is one of the conservatives, FDP and Greens,” said GMS. Both the Greens and FDP - who are at opposite ends of the political spectrum - have played down the likelihood of joining forces, fearing it would put off their voters. But on Thursday, FDP leader Christian Lindner struck a more positive note. “One has to go into government. The FDP is enthusiastic about going into government. But only if it can implement good things. If not, then we won‘t,” he told Die Welt. Fears in Germany that voter apathy could boost the far-right Alternative for Germany (AfD) in Sunday’s election have driven Chancellor Angela Merkel and her main rival in final days of the campaign to urge their backers to go out and vote.